After one year and two weeks, we have sampled every single eating establishment on the west side of the 101 between Kotija at Leucadia and PCG in Cardiff. (We skipped The Chart House because of our no big chains rule.) We’d finished the first half of what we set out to do. We were ready for The Crossing. This was a big moment. Ready to head to the east side, we celebrated our crossing over the 101 with a parade full of noise makers, pom poms, decorations and cheer. Mayor Faulconer gave a speech, traffic had to be rerouted, and you will likely see us on the local news. Ok, ok, maybe there were only 11 of us, and the mayor had more pressing business elsewhere, but we DID have noisemakers and hoopla. We have tried coming to Las Olas a few times over the years, but every time we tried, there has been no parking in their dirt lot and a line that threatened too long of a wait. So we would always end up going somewhere else. This time we got smart. They don’t take reservations at Las Olas, but we went on Seis de Mayo at 4:30pm to put our name in for a big table. After our extravagant parade, our table was ready for our 5:00pm dinner. But we noticed that just 15 minutes later, the line was L-O-N-G to get in. We hit it just right. Their chips and salsa were quite good. Guac is always a must and theirs doesn’t disappoint. Their success lies in the fact that they don’t over do it. 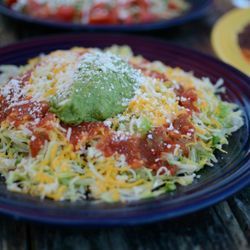 They use perfectly ripe avocados, add in a few things, and then serve it without a lot of fuss. Very good. Merilee was excited to order a Skinny Margarita, because apparently they are hard to find. Having partaken in cocktails the previous night, I needed to detox tonight. . For those of you who don’t know what a Skinny Margarita is, it has all of the alcohol as a regular margarita but actually makes you skinnier the more you drink them. I know what to order next time I’m there, duh. Los Olas is great for small to medium groups, but their largest seating is for 10. We were 12. We made it work, but it was cozy. Yep, that’s it! These are the two award winning shots I have to work with for tonight’s blog! I don’t want to be too critical though. The first shot of this Chicken and Sour Cream Enchilada is taken at an artistic angle while the second is taken straight down. Why he chose to shoot only one dish twice, with 11 other plates of food around is a wonder though. What’s that old saying that if you want something done right….well, whatever. Let’s be honest. Most of the food here looks very similar. We all got some or other combinations of tacos, burritos and enchiladas. They all came with rice, beans and/or cabbage salad (my favorite). The food was very colorful, served in large portions, and tasted great. Mary & Geoff ordered shrimp tostadas which came on a flat corn tortilla that they preferred over the typical fluffy fried flour one. (I had to lift this photo off of Yelp. I hope I’m not breaking any copyright rules.) They actually ordered two, but they were so big, they took one home. You can’t tell from the picture, but there are a lot of shrimp in there! Las Olas is well-decorated with tasteful Mexican decor. No tacky mariachi music will interfere with your dining experience. You know that one person who just refuses to take off their party hat after the parade is long over? That’s Lubby…er, Hubby! But he’s so cute! When you need great local Mexican food to show off to your out of town friends, but you want something a step up from a CTS, Las Olas is the perfect place. The ambiance is wonderful. It’s situated across the street from our beautiful Cardiff State Beach, with plenty of friendly happy locals crowding the bar. Go early or be prepared to wait and wait for a table. But the food is worth it. Prices are on the higher side, but you will likely need a to-go box. And if you have a 16 year old at home like me, that’s breakfast! Always totally delighted when I see I’ve received your most recent culinary adventure. What a terrific writer, a great humorist, and most importantly, a wonderful appetite! Thanks for all the helpful, fun-to-read information! Thank you for reading and for the nice comment! Much appreciated!